June 11th proved that we can expect miracles. Despite ominous predications of stormy weather that would dampen the spirits at any charity event, The Expect Miracles Charity Golf Classic beat the forecast without a single drop of rain. We believe it was fate, as MFAC added a new component to its renowned charity event, a kid’s golf clinic that proved to be the overriding highlight of the day. MFAC not only celebrated its 15th annual Expect Miracles Charity Golf Classic, but launched the event’s first Kid’s Golf Clinic. We were blessed to have these amazing kids be a part of this wonderful day. Read more about the Kid's Golf Clinic. 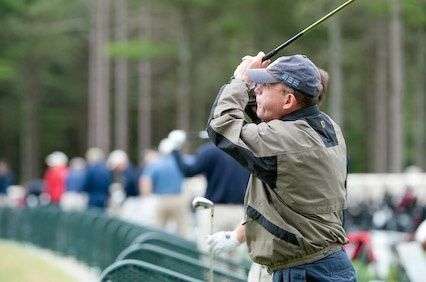 In spite of market conditions, the mutual fund and financial industry once again came together on June 11th for the 15th Annual Expect Miracles Golf Classic to support Mutual Funds Against Cancer (MFAC). The event raised over $475,000 for its mission to support The Center for Applied Cancer Sciences (CACS). Although revenue was down for the first time in MFAC history, the amount raised is an extraordinary feat when factoring the economic climate and the state of the financial institutions world-wide. MFAC was elated to hold its first Kid’s Golf Clinic, which gave everyone a reason to celebrate. The Golf Classic, with Foundation Sponsor Interactive Data Corporation, hosted more than 380 golfers representing over 60 mutual fund and financial services firms. The overwhelming support and interest in the event once again prompted us to expand to two golf venues - Pinehills Golf Club and Waverly Oaks. The Kid’s Golf Clinic included recent cancer survivors and children who are currently in treatment. The event continued into the evening with a dinner and awards ceremony, coupled with a live and silent auction raising over $30,000. Several, special awards were presented at the reception by MFAC's founder and Chairman, Frank Strauss. Larry and Judith Theriault (twins) received the Guardian Angel scholarship. This scholarship is given annually in memory of Paula Pearlstein, a long time MFAC supporter who passed away in 2004 at the early age of 32. Ken Starr, a cancer survivor from Interactive Data, was awarded the Expect Miracles Award for his dedication and contribution to MFAC over the three years. Doug Quagliaroli received the CJ Award for his heartfelt contribution to MFAC with his moving photography series “Faces of Hope,” which paid tribute to cancer patients and was the theme of MFAC’s 2008 Wine Event along with other special contributions to the MFAC family.